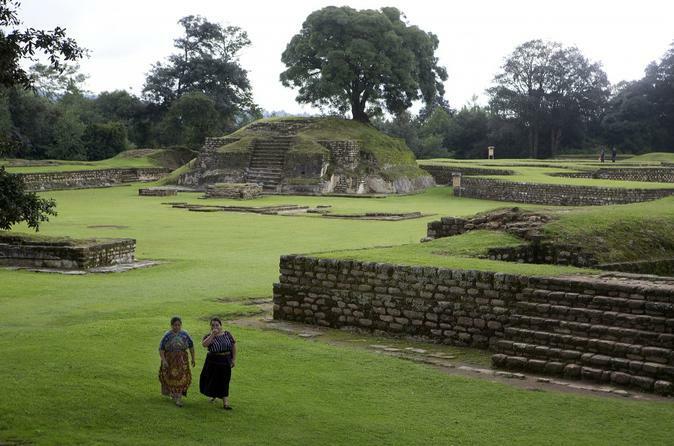 Discover the ancient Kaqchikel Kingdom at Iximche, a Maya city conquered by the Spaniards. Travel outside Guatemala City via the Inter-American Highway to Guatemala's first capital for a guided tour of the archaeological site. Round-trip transfers are provided. This mayan kakchikel site is located to 60 miles (95 kms) away from Guatemala City where was established the first capital of Guatemala at the time when spanish conquerors arrive. This site have many precolumbian history, many fascinating buildings and 2 fileds where mayans played ball. Actually you can find many mayan rituals that are done on the site. If you are hosted in Guatemala City you will be picked up between 7:30am and 8:00am, if you are hosted in Antigua you will be picked up between 9:00am and 9:30am. You will be arriving to Iximché at 11am and across 1 hour and 30 minutes you will know and enjoy all that this site have to show you, structures, history and rituals. At the end of the tour you will be transfered to Tecpan to enjoy the lunch. If you are in Antigua you will be back around 3 pm, and if you are in Guatemala city you will be back around 4 pm.